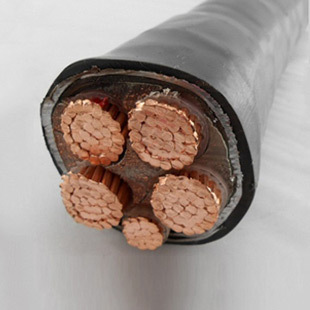 YJV XLPE insulated power cable (YJV, YJV22)_Guangdong Zhujiang Wire & Cable Co., Ltd. Features: Scope of application: Features of AC transmission and distribution lines with rated voltage Uo/U of 0.6/1KV and below: High mechanical strength, good environmental stress resistance, excellent electrical performance and chemical corrosion resistance, light weight and simple structure. Easy to use. High mechanical strength, resistance to environmental stress, excellent electrical properties and resistance to chemical corrosion and other characteristics, light weight, simple structure, easy to use. Cross-linked polyethylene insulating power cable with high mechanical strength, good resistance to environmental stress, excellent electrical properties and resistance to chemical corrosion and so on characteristics, light weight, simple structure, easy to use. 1. insulation wire core identification using color belt or pigment color difference. 2. multi-core cable USES compression fan design, stable structure, light weight, small diameter. 3. with excellent electrical properties, high breakdown electric field intensity. 4. small dielectric loss Angle tangent value of tan delta, high insulation resistance. 5. a higher heat resistance and anti-aging properties, allowable operating temperature, load flow. 6. cable can bear external mechanical forces and large tensile resistance, simple installation maintenance. 1. the conductor dc resistance conforms to the requirements of GB/T3956-2008. 2. the finished cable insulation performance meet the requirements of GB/T12706.1. And should be subjected to 3.5 kV ac voltage test for 5 minutes without breakdown. 1. cable laying, installation of the environment temperature is not lower than 0℃, the bending radius should not less than 12 d cable diameter. 2. cable conductor of the highest working temperature for a long time does not exceed 90℃. 3. short circuit (the longest duration of no more than 5 s) cable conductor of the highest temperature does not exceed 250℃. In laying indoors, in tunnel, in cable trench and pipeline, can also be buried in the soil of loose, cable traction, can bear certain occasions but unable to bear external mechanical forces. Single core cable in magnetic duct is not permissible. YJV cable model, namely 0.6/1 kv crosslinked polyethylene insulated PVC sheathed power cable. YJV22 type cable, namely 0.6/1 kv crosslinked polyethylene insulation tape armored PVC sheathed power cable. Two of the biggest difference between YJV model without inner sheath and armoring, only a single sheath, and there are inner sheath YJV22 plus metal armoured and outer sheath, namely double sheath. YJV cable model more softer, and YJV22 type cable tensile compressive performance better.